The lives of Skeeter, Minny and Aibileen couldn't be more different in Jackson Mississippi - Skeeter is an aspiring writer, Minny is a maid with a major problem of sassing back at her employers, and Aibileen is a maid just trying to instill colorblindness into her young charges. 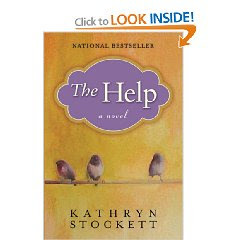 But over the course of Stockett's debut novel, they all have many secrets to share and hide from themselves, their families and the town itself. When Skeeter attempts to write her first book, Minny and Aibileen will come to play pivotal roles in a dangerous situation. I enjoyed this book greatly and I could genuinely see how it's remained so high on the NYT best sellers lists. The story moves along at a nice pace and the language makes it very approachable.